Galloway cattle evolved in the province of Galloway in Scotland at a time when it covered much of the south-west lowlands of that country. They were recognized as a distinctive breed as early as the sixteenth century at which time they were mostly black – but also occurred as red, dun and brindle – and many of them were horned. A Galloway Cattle Society and the first Herd Book were started in 1877, at which time only black polled animals were admitted for registration. 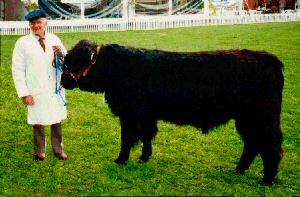 Subsequently, dun and belted animals were also recognized, although the Belted variety was given separate breed status in 1921 (see » Belted Galloway). The Galloway is a medium-sized, polled breed, and its unique feature is its double weatherproof coat which gives it its distinctive rough appearance. Galloways were first imported into New Zealand in 1947. They were promoted as a beef breed that would do well on rougher pastures in the colder parts of the country, and they are extremely hardy. However, they have never achieved great popularity in New Zealand.